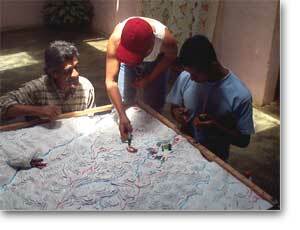 1:3,000 scale Participatory 3D Model of the Potrerillo sub-watershed, Microcuenca de Pescador, Cauca, Colombia. Year 2001. The model covering an area of 14 sq. km has been done to test the feasibility of the P3DM approach. the models produced in the framework of the “Making Spatial Soil Fertility Research relevant by Integrating Local Knowledge” Project. The initiative has been implemented by the Centro Internacional de Agricultura Tropical (CIAT). Research hypothesis: Scientists and farmers have different spatial perceptions of natural resources. Successful research has not very successful adoption rates because provided information is frequently not considered relevant by farmers. Local knowledge, visualized in P3DM, might help to make soil research more relevant by focusing fundamental research on relevant problems.